The Supercharger network allows Tesla’s vehicles to travel long distances, which makes the network one of Tesla’s most important asset and it grew significantly in 2015. When other manufacturers start dropping 200 mile range electric cars, Tesla’s Supercharger network will be a key differentiator. Tesla started the year with 331 Supercharger locations: 152 in North America, 120 in Europe and 59 in Asia. In early 2015, deliveries of Tesla’s Model S P85D started to pick up and videos of reactions to the car’s incredible acceleration started to flood Youtube. Tesla hides some of the most interesting easter eggs in its vehicles and in February, some Model S owners found that they could change the rendering of their vehicle on the console to the car-submarine hybrid Lotus from a James Bond movie. By March 2015, Tesla’s Gigafactory project was well-underway. We had one of our best look at the progress of the factory through pictures by Steve Jurvetson during a visit from Tesla’s top brass in early March. Pictures via Steve Jurvetson’s Flickr. Tesla launched a new version of the Model S. This time with a 70 kWh battery pack and several new colors: Warm Silver, Obsidian Black and Ocean Blue. On May 1, 2015 Tesla launched its ‘Tesla Energy’ product line consisting of the Powerwall and Powerpack, which are stationary energy storage products aimed at residential, commercial and utility-scale projects. How many miles did you contribute to the 1 billion? July was an important month for Tesla. The company again released a new version of the Model S, this time with a 90 kWh battery pack. The new Model S P90D is available with a new “Ludicrous mode”, which enables acceleration from 0 to 60 mph in just 2.8 seconds. The updated lineup doubled the nameplate trims of the Model S from the previous total of four (70D, 85, 85D, P85D) to a new total of eight (70, 70D, 85, 85D, 90, 90D, P85D, P90D). 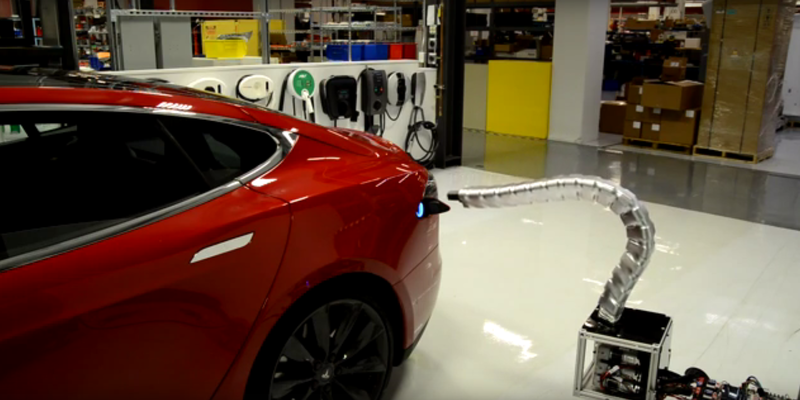 Even though Tesla only released a teaser in August and we don’t have a timeline for production, I still think that the self-plugging charger prototype is one of coolest thing we’ve seen from Tesla this year. This charger is an important piece of the puzzle for self-driving cars. We can now imagine a not-so-distant future where Teslas can drive themselves into garages with the Autopilot and the charger takes care of the rest. September is all about the Model X. Some have been waiting for years to see the final version of the vehicle and they finally had the chance at a well-received launch event in Fremont, California. If September was all about the Model X, October was all about the Autopilot. Tesla released the version 7.0 of its software with several new features including Automatic Emergency Steering and Side Collision Warning, ‘Autosteer’ (Beta), Auto lane changing and ‘Autopark’. Tesla updated the planned floor space of the Gigafactory to 13.6 million square feet (1.3 million square meters). 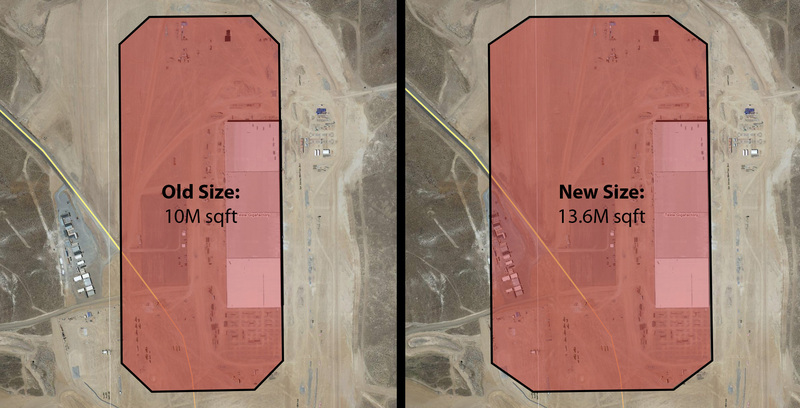 Once finished, the new size appears to put the Gigafactory in contention for the largest building in the world by volume, a title currently held by the Boeing plant. It is expected, however, to fall ever-so-slightly short of that title given its known 71-foot (21.6-meter) height. The Gigafactory will be the largest building in the world by footprint (Tesla’s Fremont-based car factory currently holds second place), and the fourth largest building in the world by floor space. As the year is coming to a close, we look at what 2016 holds for Tesla. The Model 3 will likely be an important part of Tesla’s year with the unveiling planned for March. We also expect a ramp up of Tesla Energy production with the company signing deals left and right for the distribution of the Powerwall and Powerpack. 2016 will also be the first full year of Tesla having two vehicles in its lineup: The Model S and X.
Electrek will be back in 2016 to cover Tesla and the broader electric vehicle industry. Make sure to follow us on your favorite social media to get our latest articles: Twitter, Facebook or Google+.